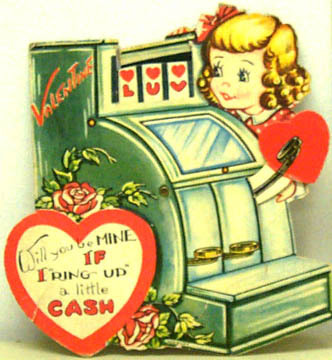 In the spring of 1984 I moved from Philadelphia to San Diego where I discovered a beautiful battery-operated toy cash register that looked exactly like one I’d had as a child. I bought it for $10 and set it on my windowsill to admire. Twenty years later I have over 100 toy cash registers and love every one. This is the story of how one little toy turned into a passion for collecting. For the first few years my toy cash registers functioned simply as a decorative element for my windowsill. They had not yet achieved the status of being a "collection." At a certain point I realized that I had something worth displaying, and I started cataloging and displaying them. The first home computer, the Apple computer, had just come on the market and none of us knew how to use it yet, so instead I created color-coded catalogue sheets and dutifully recorded the make, model, and measurements of each toy. During this time there weren’t that many items available, so my standards were very low. In other words, I bought anything that I found. Things went along this way until 1999 when I discovered eBay. Prior to the internet, collecting was limited by geography in that I could either buy new toy cash registers at toy stores or old ones at antique shops; a costly proposition. eBay created a world market, so that items like the 1970’s Tom Thumb metal cash registers which previously sold for $60+, now are worth $5 or less. They became essentially worthless because of this shift to an international market. The resulting loss in value is the downside of this revolution. The upside is that I can now buy items that are both unusual and relatively inexpensive. I’m very lucky that I collect something that possibly no one else does (to my knowledge) which means that I can get far better deals than if there was a huge competition like there is for popular collectables like dolls and teddy bears. I rarely play more than $35 for an item, and quite often significantly less. This change in how toys were bought and sold affected my collection in a major way. Once I realized that the majority of my collection had little worth, I created a more focused mission statement which centered on collecting only character-based registers like Disney and Sesame Street, musical cash registers, one of a kinds, and miniatures. I changed my mindset from an approach of buying anything I could get my hands on, to only buying items that made my heart go pitter patter. Around 2002 I found that my livingroom had become overrun with toys, so I donated about 150 registers from my collection to a local good works group. This donation included contemporary toys that had no distinguishing features, older registers like the ubiquitous Tom Thumbs, and antique items that I just plain didn’t like. I didn’t want anything taking up space in my home unless it had some unique design factor. I can just imagine what they were thinking when they opened up all those boxes! The best buys I’ve found have been ones where the seller was unaware of the value of the item, and started with a very low bid. If I was really lucky, they offered a low "Buy It Now" price which I was able to snap up. The key thing here is to check the listings every day so that you can catch items as soon as they are put up for bidding. If you are working on a budget, as most of us are, don’t waste your money buying items that are just "nice." Wait for the truly special items and bid more for them. If you are using eBay, learn to use the advanced search mechanism so that you don’t have to browse through tons of irrelevant items. For example, if you simply search of "cash register" you will find thousands of them, most of which are actual cash register, not toys. But also be careful not to look in too narrow a category area such as "mechanical banks" because many interesting items are either misfiled in other categories, or things you might not have thought of. A good example of this is the tape measure cash register, which is not considered a toy. In the beginning it can be difficult to know what is a truly unique item, and what is not. That’s why educating yourself is the single most important factor in getting good deals. Sellers often call their items "antique" and "rare" even if they aren’t. My approach now is to bid a medium low amount, then check in near to closing. I place a large bid on the item a few hours before it closes so that the other buyers are less likely to respond to the outbid notices before the item closes. There are several reasons why toy cash registers really speak to me. A lot of people think that it’s because I’m a shopaholic or money hungry, but it’s not that at all. I’ve always enjoyed toys even though I’ve never particularly enjoyed children. I love the bright colors and the amazing number of creative ways that toymakers come up with unique and wonderful products. The bottom line is that there’s something intangibly wonderful about toy cash registers that I still feel after twenty years of collecting. Toy cash registers have some similar features with both typewriters and with slot machines so things can get muddy sometimes. I decided early on that I needed to be careful about what I collected so as not to dilute my collection with items that didn’t fit my mission. There is no one descriptor that you can use for every toy in my collection, rather I define a toy cash register as a toy that has the "spirit" of a cash register. This usually includes one or more of these type of character traits: buttons you can push, pop up tabs with the prices, a cash drawer, and a hand crank. When there’s doubt in my mind, I look at whether the item has a preponderance of these descriptors. What is a Well-Designed Toy Cash Register? I believe that an interesting collection, whether toy cash registers or matchbooks, should have a focus. I focused my collection primarily for space reasons, but any collection will be far more interesting if there is a theme. As with all collectibles you’ll look for condition, rarity, and age. What I look for specifically with toy cash registers is for creativity and unique characteristics, as well as detailing. This is the reason that I don’t collect a number of well-known toy cash registers including the Uncle Sam and Tom Thumb lines. The reason is that I don’t find these designs at all creative or pleasurable to look at. If you look at my favorites (see sidebar at right) you’ll notice that each one is truly unique in some way, fun to look at, and brings you back again to look again. One of the most common questions I hear is "why don’t you collect real cash registers?" The answer to that is because they are big, heavy, and expensive. Besides, toys are much more fun! I also do not collect items that are not unique in any way, pictures or other collateral materials (with a few notable exceptions), or accoutrements such as lights, advertising toppers, coin dishes, drawers, keys and so on. This is not unique in any way, but it's a lovely example of the traditional cash register design with the rounded front. It's quite pretty. Blue Box, Singapore. This is from Creative Playthings in Princeton, New Jersey where I lived until I was about 12. It's absolutely unique in that it's entirely wooden. This is the current version, still with the cute Hello Kitty figurine. Electronic of course. This register is the very first electronic one I've seen that has a REAL hand scanner (not pretend). It comes with items that have bar codes on them, and this scanner actually read the bar codes. Amazing! Toho, 2002, China. This Barbie register really floats my boat. Slide the little American Express card to make the register "modem" for approval, complete with electronic modem sounds. It then says, "Charge Approved!" Clearly Barbie never maxes out her credit cards. Mattel, 2002. Do you have a toy cash register for sale? This is rare, and usually sells for about $100, although I have paid as little as $10 for one of mine. What is truly unique is the absolutely stunning tin lithography. This is one of the "hand grabbing the coins" banks which makes it doubly a kewl item. I am absolutely fascinated by this toy because the designers really went all out in creating a unique toy cash register. Almost 100% of American toys are designed in primary colors, but this is a lovely gold like goldfish. Also the scanner is a sunglasses clad goldfish, and the buttons are goldfish shaped. Wonderful creativity! 2003, Made in China. This working Timex clock is nicely detailed and unusual because of the clock feature. Circa 1990's; Made in China. Although the cash register is only a small part of this little Enesco figurine, I was captured by its delicate and detailed sculpture. There is a sense of gentleness and serenity here.1984. A stunning silver miniature made by Bodo Hennig of Germany. This cost me $60 retail and was worth every penny for it's heavy silver construction, detailed ornamentation, and all working parts. Circa 1990's. This beauty wins a best design award for its purple color and for how it opens up into a child's nursery. What really clinches the deal is that in the nursery there is a teeny tiny cash register which of course makes no logical sense, but appealed to the mischevious in me. Bluebird toys, Swindin England, 1994, Made in China. Look closely and you will see a stylin' fifties guy driving a convertible. It has a cash register in the back filled with tiny coins. When you "drive" the car along a surface, the coins jump like Mexican jumping beans. This premium is part of a set that McDonalds gave away as prizes. This is doubly unusual because there is no commercial tie in or McDonalds logos on the item, unlike contemporary prize items. TM & Warner, 1992, Made in China. Exceptional detailing makes this wooden miniature something to go shopping for. Working crank and drawer. Says something like "Pobolo" on the back. I almost had heart failure when I saw this beautiful item. I love metal art, so I wanted it for the "distressed" tin design. When you wind it up, it' plays "If I were a Rich Man" from Fiddler on the Roof. This is extremely rare, and I've only seen it for sale once (and I snapped it up!). A heavy silver musical register that plays "happy birthday." That's a strange theme song eh? I like this one particularly because it's such a heavy silver and feels good in the hand. Godinger Silver, Made in Japan. This is a squeezy toy which makes that squeak when you give it a squeeze. It's probably a dog toy rather than a baby toy because it's too big for a baby to hold. I first saw this item on eBay in 2000 but I wasn't paying attention and lost the bid. It's such a bizarre item that I figured I'd never see it again, and I regretted the loss greatly. I was thrilled to find it again in 2003 and snapped it up for $7. I would have paid far more! The front of this register is near transparent so you can watch the cool little gears go round and round. The crank on the right winds it up. Totally unique! In contrast, here are some examples of what I consider really boring examples of toy cash registers. The colors are uninspired, there is little artistic or creative merit, and even the shape is common. This is a typical Tom Thumb, many of which came in depressing colors like grayish pink and grayish green. This example is a step up from the typical Tom Thumb because it has the security drawer above the cash drawer. Koval's lists several of these as being worth $75 or more, but you can get them for $5 any day on eBay. There’s a version one better which has a receipt apparatus. I used to own about ten of these until I looked at them one day and said "Why in the heck am I keeping these?" Looks like Tom Thumb in form, but lacks even what little style the one at the left has. These are hugely popular as banks because they force you to save to $10 before you can get your money out. Nevertheless, I find the designs lacking in creativity. They are the only cash register banks that are well documented, so they may actually have more worth in a collection than some others. See References below for a price guide on these. Typical example of a toy available at any toy store. Sure it’ll do the job if your objective is a toy for your child. But a collectible it’s not.